© Posted on November 20, 2017, by Michael E. Newton. Two weeks ago, I shared with you an appraisal witnessed and signed by David Beekman and Alexander Hamilton on April 22, 1767. Last week, I presented a mortgage owed to David Beekman that was witnessed and signed by Nicholas Cruger and Alexander Hamilton on August 10, 1767. In addition to being noteworthy as the oldest known Alexander Hamilton documents, these recently discovered records provide numerous insights into Hamilton’s childhood on St. Croix. Perhaps the most remarkable implication relates to Alexander Hamilton’s youth and maturity. If Alexander Hamilton was born in 1757, as the best analysis of the evidence concludes, these documents show him serving as a legal witness and signing the papers as a mere ten-year-old boy. Even if one believes that Hamilton was born in 1755, he was still just twelve years old when he served as a witness, a no less remarkable feat. For Hamilton to have acted as a witness, both the parties to the transactions and the courts must have thought Hamilton mature enough to perform this duty. 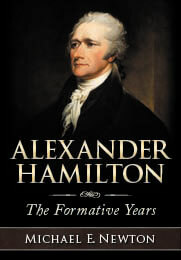 We already knew from later evidence (e.g., Hamilton’s November 1769 letter to Edward Stevens [The Papers of Alexander Hamilton 1:4 and Founders Online] and Hamilton’s management of Nicholas Cruger’s company) that Hamilton was a child prodigy and more mature than his years would suggest, but these documents show a mature and responsible Hamilton years earlier than previously known. They also show that others had noticed Hamilton’s precocity even at this early date. These documents also provide strong evidence regarding the commencement of Hamilton’s employment with Beekman & Cruger. Prior to the discovery of these documents, the question of when Hamilton started to work has been the subject of much speculation with a wide range of conjectures. Some believed that Hamilton started working for Beekman & Cruger shortly after the partners opened their St. Croix mercantile operation in early 1766. Others supposed that Hamilton worked in his mother’s store and perhaps went to school until his mother died in February 1768, at which point he needed a job and was at this time hired by Beekman & Cruger. Others speculated that since his wealthy cousin and uncle (Peter and James Lytton) took him in after his mother died, Hamilton did not start working for Beekman & Cruger until after his new guardians passed away in the summer 1769, just prior to his November 1769 letter to Edward Stevens, in which he mentions his employment as a clerk (The Papers of Alexander Hamilton 1:4 and Founders Online). But these possibilities were mere speculation. There was no evidence for any of these conjectures over the others. With the discovery of these new documents, in which we find Hamilton with Beekman in April 1767 and with both Beekman and Cruger in August 1767, it is clear that Alexander Hamilton was already working for Beekman & Cruger by this time. When David Beekman or Nicholas Cruger needed someone to serve as a witness, they simply enlisted the services of their trusted clerk, Alexander Hamilton. Not only does this show Hamilton working for Beekman & Cruger in April 1767, but it also shows that he was a trusted member of the organization and must have been working there for some time. It is impossible to determine with certainty based on these newly discovered documents when Hamilton started working for Beekman & Cruger, but it would not be unreasonable to assume that it was in 1766. With this clearer idea of when Hamilton began to work for Beekman & Cruger, another remarkable fact emerges. Knowing that Hamilton worked for Nicholas Cruger until September 1772, if he started working for Beekman & Cruger in April 1767, it would mean that Hamilton was employed by Beekman & Cruger and then by Cruger alone for five years and six months. And it is likely that Hamilton worked at this job for six years or more since it is clear that by April 1767 he had already been employed by Beekman & Cruger for some time. In contrast, Hamilton worked as an aide to George Washington during the American Revolution for four years and two months and was Secretary of the Treasury for five years, four months, and twenty days. He worked many years as an attorney, but never more than a few continuously because public service repeatedly interrupted his private practice. Accordingly, what previously had only been supposed is now clear: Alexander Hamilton’s employment with Beekman & Cruger and then Cruger alone was his longest continuous job. These new facts also call into question a popular myth often told about Alexander Hamilton. If Hamilton started working for Beekman & Cruger in 1766 or early 1767, when exactly was Alexander Hamilton “impoverished” and living in “squalor,” as some biographies and musicals assert? We know that when Hamilton’s mother was alive, he did not live in squalor. Hamilton’s mother ran a business, turned a profit, owned leather chairs, silverware, slaves, etc. She may not have been among the upper class, but she was far from impoverished. Moreover, Hamilton’s cousin and uncle, who served as his guardians after his mother’s death, were quite wealthy; indeed they were among the wealthiest people on St. Croix. We now know that Alexander Hamilton was already employed as a clerk for Beekman & Cruger and therefore making a decent salary long before his mother, cousin, or uncle died. Although far from wealthy, Alexander Hamilton was never “impoverished” or living in “squalor,” as some biographies and musicals assert. The discovery of these records also enables us to conjecture about another reported Hamilton document. In the first post of this series, I mentioned that George Bancroft had claimed in 1858 to have seen a 1766 “legal paper” signed by Hamilton. This document has since been lost and never recovered. In Alexander Hamilton: The Formative Years, I speculated that “Alexander Hamilton’s signature on a 1766 legal document, which has been lost since its discovery, could have been related to his work for Beekman and Cruger.” With the discovery of these 1767 legal documents, it seems even more plausible that this 1766 “legal paper” indeed was signed by our Alexander Hamilton, that the 1766 date is correct, and that it probably was related to his work for Beekman & Cruger. Coming about 160 years after George Bancroft wrote about the 1766 “legal paper” and 80 years after H.U. Ramsing discovered the Rachel Lavien probate record (see the first post of this series), the discovery of these Alexander Hamilton documents from 1767 gives us hope that additional Hamilton documents may still be found. Who knows what else is out there waiting to be discovered and what else we may learn about Alexander Hamilton’s childhood? Hamilton was more mature and responsible at an earlier age than previously known. Hamilton started working for Beekman & Cruger in 1766 or early 1767. Hamilton’s employment with Beekman & Cruger and then Cruger alone was his longest continuous job. Hamilton was never “impoverished” or living in “squalor,” as some biographies and musicals assert. There may be even older Hamilton documents waiting to be discovered. © Please cite this blog post when writing about these new discoveries or quoting this blog.